The managing director of Ceram GmbH Ingenieurkeramik is engaged in production and development of ceramic spray- and sinterpowders for more than 30 years. This experience guarantees a competent and professional consultation in all interests. It is of utmost importance for us to produce powders of first-class quality. Only high-quality raw materials are used in our modern manufacturing plant. 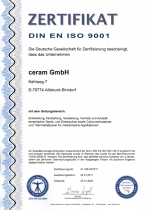 In addition we have established the quality management system DIN EN ISO 9001:2015 which ensures all production steps from purchase up to dispatch. Furthermore we are certified according to DIN EN ISO 14001:2015. Our products are internationally distributed. A special emphasis is put on individual solutions and flexible working processes to offer a maximum of service to our customers. We would be very pleased to receive your questions and suggestions. Note: You can revoke your consent at any time for the future by sending an e-mail to info@ceram-gmbh.de.